Our mission is to deliver cost-competitive clean electricity, product choice, price stability, energy efficiency, and greenhouse gas emission reductions. VCE is short for Valley Clean Energy Alliance the joint powers authority serves electricity customers within the cities of Woodland, Davis, and unincorporated areas of Yolo County and launched services in June 2018. VCE offers choice in the electric utility market. When customers choose VCE, they help empower local control of electricity procurement decisions, reduce the carbon footprint associated with their electricity service, and help support growth of local renewables. VCE is governed by a six-member Board of Directors, two each from the Woodland City Council, Davis City Council, and the Yolo County Board of Supervisors. As a community-governed entity, VCE gives customers access to the people who make the rate and service decisions: supervisors and council members whom they already know. The Board is advised by its nine-member Community Advisory Committee. Board meetings are held monthly, alternating between the Cities of Davis and Woodland. See Meetings page for more information. After an extensive due diligence process, VCE selected Sacramento Municipal Utility District (SMUD) to provide technical and energy services on a contract basis. These services include data management and call center services, wholesale energy services, credit support services, and up to five years of business operations support. VCE found that SMUD provides the greatest overall value to VCE through close mission alignment, service cost competitiveness, and by providing the opportunity for VCE to build internal capacity over time. VCE maintains full program control/autonomy and operational flexibility while taking advantage of SMUD’s extensive energy sector experience. Working with SMUD allows VCE to take advantage of SMUD’s energy sector experience and organizational capacity, while adapting SMUD’s established risk management policies and procedures to serve VCE’s needs. VCE is governed by a six-member Board of Directors, two each from the Woodland City Council, Davis City Council, and the Yolo County Board of Supervisors. The Board is advised by its nine-member Community Advisory Committee. Board meetings are held monthly, alternating between the Davis Community Chambers and the City of Woodland Council Chambers. VCE is advised by the nine-member Advisory Committee. This nine-member committee is composed of three representatives from each VCE jurisdiction – the City of Woodland, the City of Davis, and Yolo County. 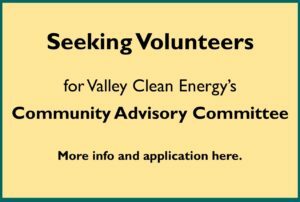 Valley Clean Energy is currently inviting applications from residents of unincorporated Yolo County to serve on the Valley Clean Energy Community Advisory Committee. Additional info and the application are available here.